Co-chair of the Gallia Historical Society Cheryl Enyart searches though text at the society on Second Avenue. The Gallia Historical Society can be found at 340 Second Avenue, Gallipolis. 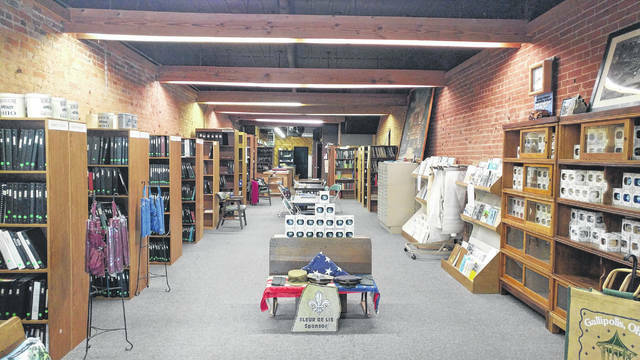 GALLIPOLIS — Approaching a year in August at its new location on 340 Second Avenue, the Gallia Historical Society is looking to revamp itself, attract new volunteers and pull grants together so that the society’s future can continue to meet and serve the present with Gallia’s past. 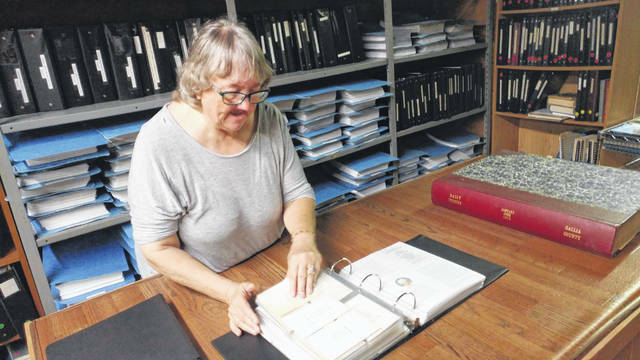 Gallia Historical Society Co-Chair Cheryl Enyart says her colleague and co-chair, Jennifer Blake, has experience with grant writing and the pair are looking to continue the mission of cataloguing Gallia history along with helping others research it. Enyart said she was enthusiastic about the society’s future despite the work ahead of it when visiting with individuals who stopped by during First Friday events last week. Among her work cataloguing and indexing the articles, she said she would like to organize her father Thomas’ work into a book called “A Hundred Years ago on the River,” a play on his column titled “Fifty Years Ago on the River” in the Tribune. She said her father always wanted to write a book. Among activities Enyart would like to see the society host would be to invite school children to learn more about the area’s history or encourage residents to seek out a past Gallia resident’s grave and research that individual, then engage in a public monologue as that individual in an exhibition. The society has collected thousands of newspaper clippings as well as text regarding the development of Gallia County and its families. Hunting down a piece of information about the origin of the Kerr Memorial Fountain in City Park or the gradual evolution of City Park’s usage is made possible though the collecting of articles like those written by past newspaper contributor Jim Sands. The historical society was first formed in 1933. Records of weddings and more are available at the society with some dating back as far as the late 1800s. More can be learned at the Gallia County Historical Society Facebook page.